Rudyard Kipling is world renowned for his works of fiction, with The Jungle Book leading the way as the most popular. 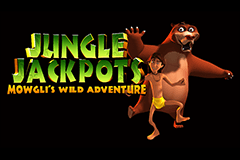 First published in 1894, the story has been retold several times on the big screen with the 1967 movie and the most recent 2016 version proving extremely popular, and now you have the opportunity to relive the jungle adventure on the reels of the Jungle Jackpots slot machine from Blueprint Gaming. You’ll be presented with an open book with the pages laced with thick vines as you recount how Bagheera and Baloo took the adventurous young Mowgli under their wing to teach him the law of the jungle and save him from Shere Khan. With the beautiful sound of birds whistling high up in the trees as the reels are idle, once you click that spin button you’ll hear a soundtrack which will make you want to sing and dance like King Louie when he proclaimed to be ‘King of the Swingers’ in one of the most memorable moments from the movie as familiar faces pop up as symbols in this 5-reeled slot with 20 fixed paylines. The high rollers amongst you will be swinging from the trees in excitement at the prospect of staking up to £500 each spin and you’ll be feeling as excited as you did when you first watched The Jungle Book as a child due to the array of bonus features Blueprint Gaming have included as there are four random features which trigger on the flip of a page and Baloo’s Bonus Game where you will play one of four main bonus features for the chance to win up to 1,000x your stake! As you are glued to the book watching symbols fall in place, you could find yourself fortunate enough to see the page turn over to reveal one of four characters as you activate one of four random bonus games for fabulous cash prizes. If it’s the adventurous Mowgli you see he will start swinging across the reels to turn random symbols into Wild symbols. Hathi will make the ground shake as he stomps across the screen leaving a trail of up to four Wild reels. Kaa will hypnotize you with any of his symbols featuring on the reels being locked in place as you pick one of three baskets to reveal a win spin, additional Wild symbols or end, while if it’s a monkey you see on the next page you better ready yourself for lots of mischief as they pull the reels up to reveal stacked symbols for serious wins. Baloo is well-known as the happy-go-lucky bear who took Mowgli under his wing to teach him the way of life in the jungle and you’ll be feeling at ease under his wing too whenever you see him pop up on the first and third reel while one of four bonus symbols land on the fifth reel as you trigger one of four main bonus features where the largest wins in the jungle can be found. Baloo’s Cash Bonus: He’s a big gentle bear and you’re going to love him even more as he pops up to deliver you with a mystery cash bonus worth up to 500x your stake. Mowgli’s Cash Trail: It’s time for a stroll around the jungle as you set off on a cash trail picking apples from the Golden Apple Tree to see whether you can advance or not. Green apples see you move along while red apples stop you in your tracks, but get to the end and you’ll be celebrating a 1,000x your stake win. Bagheera’s Free Spins: The panther will watch over you on the third reel as a Wild symbol as you enjoy five free spins with symbols which form winning combinations held in place for another free spin until there are no more. Baloo’s Colossal Spins: Here you will see Baloo fill the second, third and fourth reels as a Colossal Wild symbol with elephants wandering across the screen to increase your free spins tally. As a child you may have dreamt of being crowned King of the Swingers as sung by King Louie, but on these reels you’ll have the opportunity to become King of the Spinners thanks to the extraordinary wins that are possible from the amazing bonus features included by Blueprint Gaming - especially Mowgli’s Cash Trail where you can win up to 1,000x your stake!